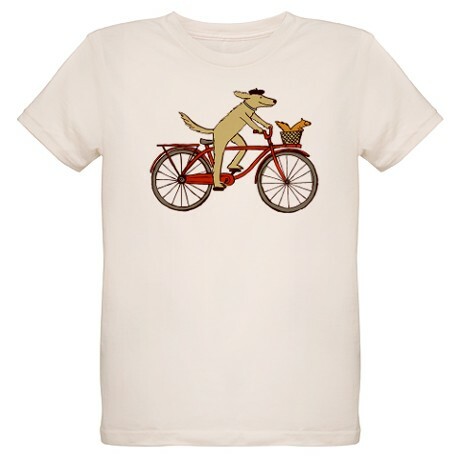 Dog and Squirrel on a Bike Shirt for Men, Women, and Kids. Buy Here. You can also buy the design as clothing, stickers, cards, and cases (iPhone, etc). Undoubtedly the cutest squirrel shirt that exists, this tribute to cross-animal friendships, and friendships in general, represents the pinnacle of adorable shirt designs. Squirrel and dog are an odd couple, for sure; Those of you with dogs will know how squirrel-hungry they are. The squirrel doesn't play a starring role here, but without him, the shirt wouldn't be great. The hand-drawn quality of the design, color choices, and subject matter make this a hands-down favorite. Also perfect for people looking for a cute bicycle shirt. Watch as dog and squirrel ride a bike together off into the sunset.